The College Francais at South Shore, Blackpool, was taken over by Isaac Gregory F.R.G.S. 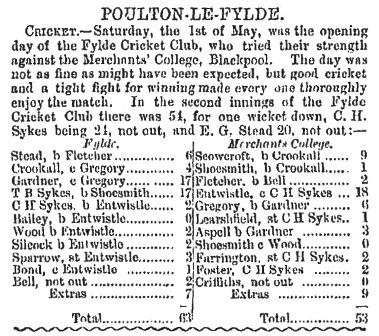 in 1869. Isaac Gregory and Chorlton Hall Academy, Manchester. Born in Nottingham c1820, he married Jane Ann, daughter of John Waterson, of Ardwick, Manchester, on Christmas Eve, 1847. In 1848, he opened a classical, mathematical & commercial academy at Chorlton Hall, Rutland Street, Chorlton on Medlock. In 1859, the school moved to Daisy Bank, Victoria Park, changing the name to Chorlton House School. 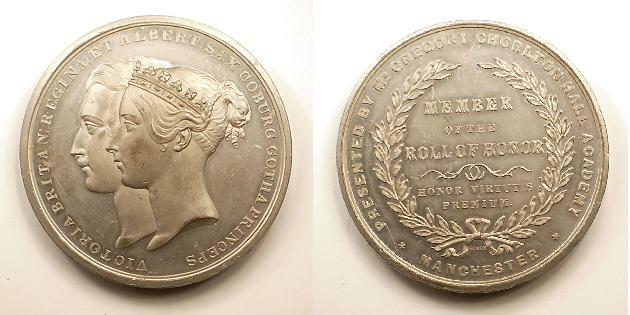 A medallion from Chorlton Hall Academy c1848. The 'Roll of Honour' was a kind of private society to which the older boys belonged. After the initiate had taken an obligation he signed the roll and sealed it, using the expression "not words but deeds" in the presence of all the scholars. The president invested the newly-made member of the roll with a sash and presented him with a medal inclosed in a case. 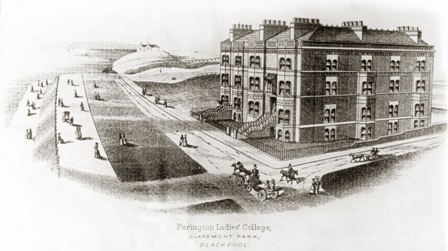 Isaac Gregory's school moved to Blackpool during the summer holiday of 1869, entering the building previously occupied by the College Francais. The school was renamed the Merchants' College and his son Thomas was the Assistant Master. He regularly contributed his opinions in letters to newspapers on subjects as diverse as 'smallpox pitting of the skin' to 'coal mining'. A lifelong liberal, in 1878 he changed allegiance and critisized the former (and future) Prime Minister, William Gladstone, sparking a very public argument carried on between the two, via the letters columns of the newspapers. Merchants' College, Blackpool, on 2nd April 1871, Census Day. The move to North Shore. Isaac's wife, Jane Ann, died about 1876 and he remarried about 18 months later.2 On 13th May, 1880 Isaac died suddenly of pneumonia, aged 60. After Isaac's death the the school at South Shore was sold. The college building was put up for auction in September. It then contained drawing, dining and breakfast rooms, 5 sitting rooms, study, library, and a large schoolroom, 40 bedrooms with bathrooms and lavatories, 2 kitchens, housemaids, cooks and butlers pantries. Rutland Gate, North Promenade, Blackpool. In 1881, two of Isaac's children, Thomas and Bertrand, reopened the school in premises further along the promenade, in Claremont Park. The address was 10 Rutland Gate and they continued running the school there for several years. Advert for Merchants' College in 1882. Miss Emily Power was the daughter of Henry Power, Vicar of Farington, Lancashire, and by 1888 had taken over the school, renaming it Farington Ladies College. 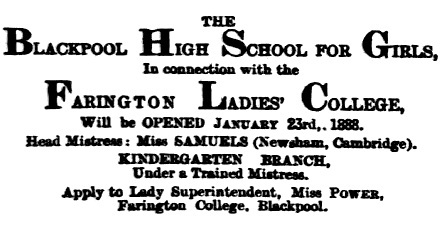 The college only lasted a few years with Miss Power as principal; she left Blackpool to open a boarding house at New Brighton about 1893 and fell into financial difficulties. 1 Quoted from a presentation given by Ann Lightbown. 3 Quoted from a presentation given by Ann Lightbown.